Coming in as medalists from the 2015 SEA Games, both Men’s and Women’s Rugby Teams had high hopes for 2017. The Women’s Team looked to build on their Bronze medal finish while the Men’s team aimed to defend their title as Gold Medal winners. With strong competition and a raucous home crowd for Malaysia, both Volcanos Teams came up short of a podium finish. At the Men’s side, started with two promising 47-7 wins over Indonesia and Cambodia. However, the 24-14 loss to Malaysia in their third match seemed to halt the team’s momentum. On the second day, hopes were further dashed with losses to Thailand and Singapore. After promising a start to their campaign, the second day of competition proved to be disastrous for the Volcanoes. 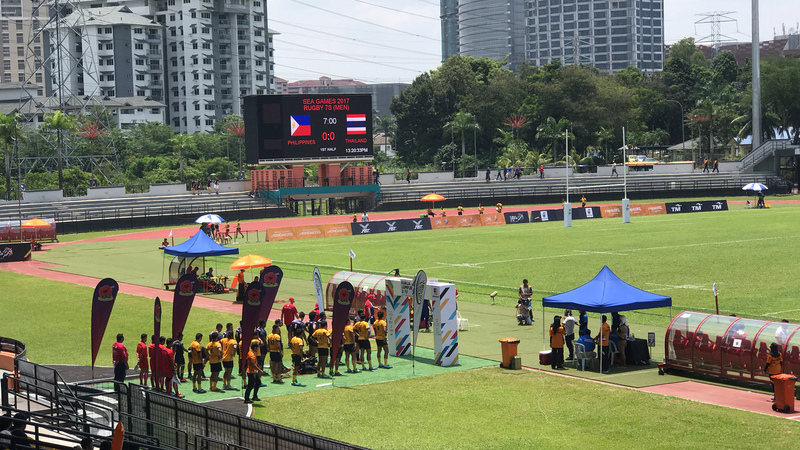 The Ladies’ competition started the same way for the Filipinas as they registered equally promising victories beating Thailand and Laos 31-0. However, their 5-5 draw with host Malaysia proved costly as it prevented a better seeding for the Lady Volcanoes. It was all downhill from there as they failed to register a victory after that match. They lost to a more determined Thailand 26-0 in the semi-finals and finished the tournament with a 5-7 loss to the hosts Malaysia. With competition in South East Asian Rugby firming up, the PRFU is focused on regaining lost glory and winning double gold medals in 2019. Something they have the potential to achieve. The MVPSF is a supporter of PRFU and its programs. For the past three years, the MVPSF has supported the youth programs of PRFU serving as a pipeline of talent for the Senior National Teams of rugby.